Candidates for the Durango School District 9-R board answer questions from the audience Thursday evening at Durango City Hall during an election forum hosted by the League of Women Voters of La Plata County. From left to right: Shere Byrd, Emily Newcomer, Mick Souder and Nancy Stubbs. 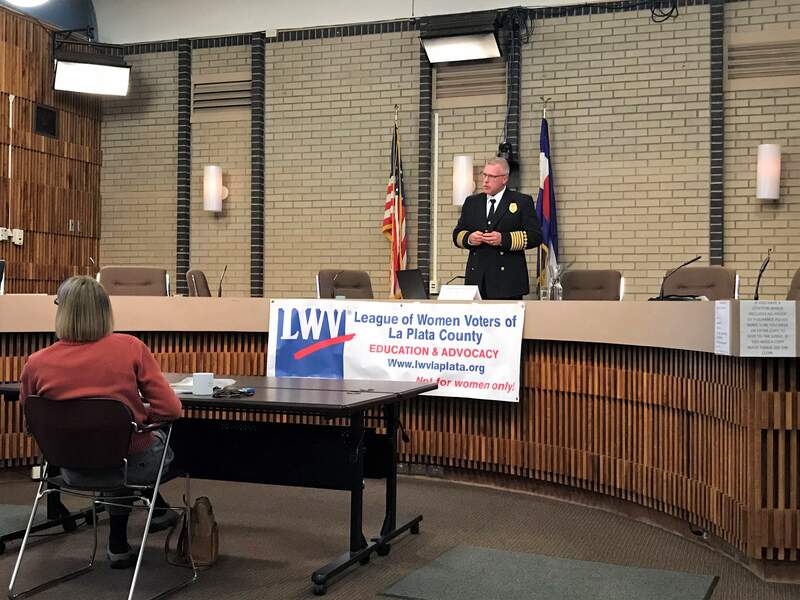 Fire Chief Hal Doughty with the Durango Fire Protection District gives a PowerPoint presentation to an audience in Durango City Hall during an election forum hosted by the League of Women Voters of La Plata County. Voters will see a property tax increase on their November ballots, which will help fund the fire district. With La Plata County residents receiving their November ballots in the mail this week, the Durango Fire Protection District and Durango School District 9-R board candidates made a final push to secure constituents’ votes. 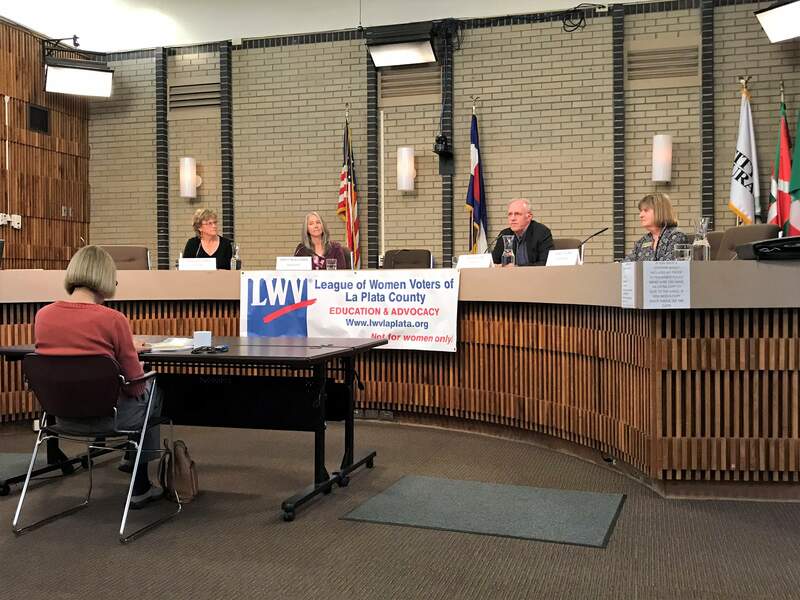 The League of Women Voters of La Plata County hosted an election forum Thursday evening at Durango City Hall to educate voters on school board candidates and the proposed property tax increase. Durango 9-R School DistrictThree of the five Durango 9-R board seats are up for election, and members typically serve four-year terms. Only District E, which includes the area northeast of downtown and east of the Animas River, is contested. Nancy Stubbs and Mick Souder, running for Districts A and C, respectively, gave brief introductions at the forum. District E incumbent Shere Byrd and her opponent, Emily Newcomer, fielded questions about their platforms and the district. Byrd, a longtime biology professor at Fort Lewis College, touted her experience as an educator and administrator. Newcomer is a licensed psychotherapist who owns her own practice, Southwest Psychotherapy, in Durango. She said she hopes to become the much-needed bridge between the mental health community and the school district. Audience members asked about a range of topics, including Durango 9-R’s anti-bullying policy, teacher salaries and the discussion of hot-button political issues in the classroom. Newcomer and Byrd agreed that students should be politically informed. Byrd said it is important for students to do research and form their own opinions on issues outside of what their parents might believe. Durango FireFire Chief Hal Doughty with the Durango Fire Protection District gave a presentation on the mill levy increase, which would support the fire district. Voters will see two different questions, depending on where they live, but the increase of 2.5 mills is the same across the district. If passed, the mill levy increase would increase the annual tax bill for homeowners by $18 per $100,000 value of their home. Commercial property owners would see an increase of $72.50 per $100,000 of property value. The district covers 325 square miles and includes 16 fire stations. It is 58 miles long, stretching from San Juan County on its northern edge along U.S. Highway 550 to the New Mexico border. “Every year for the last four years, operational costs exceeded our revenue stream,” Doughty said. He said that the number of 911 calls continues to increase every year. Last year, 5,080 emergency calls were received. If the property tax increase passes, the fire district would eventually be able to increase the number of people working each day from 18 to 26. “Increasing staff means you wait less time to get emergency assistance,” Doughty said. One audience member asked Doughty how the fire district would be affected if the mill levy failed to pass. Voters in Durango should have received their ballots Wednesday or Thursday. Bayfield residents can expect their ballots Friday or Saturday. The last day to mail a ballot is Oct. 30. La Plata County Clerk & Recorder’s Office, 98 Everett St., Suite C, Durango.Bayfield Town Hall, 1199 Bayfield Parkway, Bayfield.La Plata County Administration Building, 1101 East Second Ave., Durango.Farmer’s Fresh Market, 535 Goddard Ave., Ignacio.Three voter service and polling centers will be set up to help with voter registration, replacement ballots, ballot drop-off, in-person voting and voting machines for people with disabilities. The La Plata County Clerk and Recorder’s Office will be open from 8 a.m. to 4 p.m. Oct. 30 to Nov. 3. The clerk’s office will also be open from 8 a.m. to noon Nov. 4 and from 8 a.m. to 4 p.m. Nov. 6. On Election Day, Nov. 7, the clerk’s office will be open from 7 a.m. to 7 p.m.
Bayfield Town Hall will be open from 8 a.m. to 4 p.m. Oct. 30 to Nov. 3. Bayfield Town Hall will also be open from 8 a.m. to noon Nov. 4 and from 8 a.m. to 4 p.m. Nov. 6. On Election Day, Nov. 7, Bayfield Town Hall will be open from 7 a.m. to 7 p.m. The La Plata County Fairgrounds will be open from 8 a.m. to 4 p.m. Monday and from 7 a.m. to 7 p.m. Election Day, Nov. 7.